Now that Kendy was able to move the track changes dialog into the sidebar, some tweaking needs to be done to it. 1) The content need to fit in the default size of the sidebar, so the content size needs to resizable with the sidebar width. A minimum size of this sidebar tab should also be set, similar to the properties tab. 2) The change list needs to be changed from a column view to a row orientation, similar to the below. 3) As we have lots of vertical space, the filter tab could be moved into a content panel/section that is hidden by default and is positioned below the accept/reject buttons, so the user doesnt need to switch between tabs to filter out results. 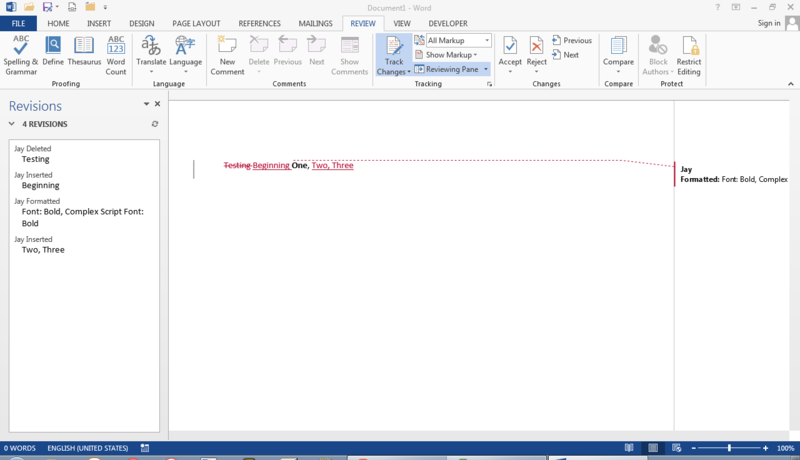 5) MS Word has summary content panel/section to show the total number of inserts, deletes, etc. I like the most of the ideas, though it's hard to predict how e.g. the list will look in real life. It looks more natural to have the filter pane (hidden) at the top. Once it expands the choices are made and the result listed below.. It's how I know more filter/search panels. > will look in real life. Yes it definitely is, so we'll have to see what the control looks like in this horizontal layout and then try to tweak it. > expands the choices are made and the result listed below..
> It's how I know more filter/search panels. Was suggesting it at the bottom as then the result list wont be shifting up and down when you open and close the filter section. > and down when you open and close the filter section. Shouldn't be any problem given the examples I gave. So OK to do it at top ? Err, we should not favor AM/PM artificially. It should use the format specified by the system’s locale. > specified by the system’s locale. Every LO local i switched to always showed it in 24-hour mode. The date format would change but not the time format. > Shouldn't be any problem given the examples I gave. So OK to do it at top ? I modified the mockup at https://docs.google.com/document/d/1UuZUJYOLPM3_LdW77OSAaUBpDhRg3iHSjo31DTUEEzk/ with some options for the list of changes. My favorite is a list view (left option) but with expanded details on click as shown with the accordion. In this case threading wouldn't be available, and we need proper sorting. If the list of changes is sorted by the time of change and users go forward step by step, which means page by page, the position in the list might have annoying jumps. Mockup attached here as well. In case we get threaded reviews (that is the change of a change), we should to show them in a tree. But this complicates some aspects and needs further work. Was checking the mockup and wanted to suggest the following. * Would be nice if we could turn the accept and reject buttons into split buttons and the split parts having entries for accept and reject all. Split buttons are good for clear alternatives but with a default in more than 80% (arbitrary number taken from the pareto rule). And I'd say Accept/Accept All has a 50/50 distribution. Without the split button, a user would have to right-click, click select all, then click the accept all button. This is with the assumption that they already know that their is right-click context menu. Having it as a split button, just gives users another means of achieving the same thing and is easily noticeable. > Accept/Accept All has a 50/50 distribution. There are normally two types of split buttons and one of them is to provide additional options of the same function that is put as the main button of the split button. An example of this is the paste button, where the drop down gives more options of pasting. Filter set in Sidebar is not selected if Manage Track Changes open separately. It should of course be the same. If I see well, Manage Track Changes (and in Sidebar) has simple Action now: + and X although there exist 4 separate actions;  Formats, Insertion, Deletion, Table Changes. So, there should be 4 different icons, not just 2. And I couldn't figure out how Table Changes is used. Not obvious and Help not of help: https://help.libreoffice.org/index.php?title=Common/Filter.